Mandal Buick GMC is the dealership to visit to find a new GMC or Buick vehicle near D'Iberville, Gulfport and Biloxi, MS. Local car buyers and drivers have a huge selection of new Buick and GMC vehicles to choose from, along with access to top-notch auto financing, professional auto service and genuine OEM parts. We have been serving Gulfport and Biloxi, MS area drivers since 1970, but our new, state-of-the-art dealership in D'Iberville allows us to better deliver a premium customer experience. Before visiting our new store, why not browse our website and shop our new vehicle inventory, apply for financing, value your trade or set up a service appointment? Which new GMC or Buick vehicle has caught your attention? No matter if you want to drive a GMC Sierra 1500 or Yukon, Buick Enclave or Regal or perhaps a late-model used car, you can find it among our extensive inventory. You can explore our complete inventory of new Buicks and new GMC vehicles in D'Iberville here on our website. Our Buick inventory consists of favorites like the new Enclave and Encore crossover SUVs, both of which feature highly refined and luxurious cabins without the luxury car price! For a highly capable and stylish new ride, view our collection of GMC models, including new Sierra 1500 and Canyon pickups and the latest Acadia and Yukon SUVs. Shopping for a car, SUV or pickup truck on a tight budget? Then see the used vehicle inventory here at Mandal Buick GMC! Our Finance Department provides Gulfport and Biloxi, MS area car buyers with low rates on auto loans. Car buyers of all credit scores can get financed here, thanks to our bad credit financing and sub-prime auto loans. To start the financing process, fill out a secure online credit application here on the Mandal Buick GMC website. 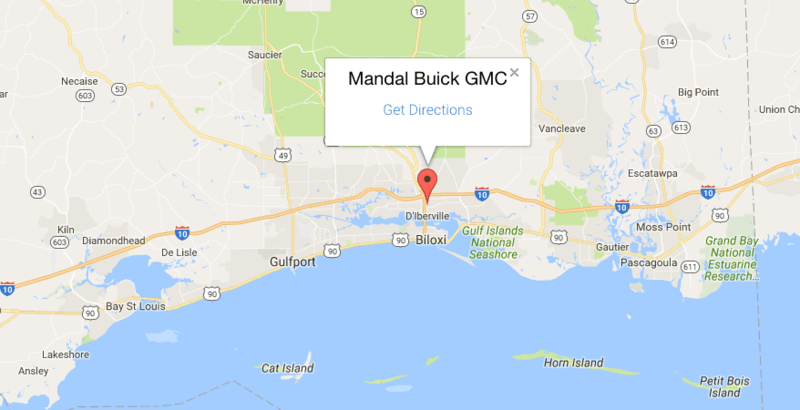 For expert auto maintenance and repair near Gulfport and Biloxi, turn to the professionals at the Service Department of Mandal Buick GMC. We employ the highest ratio of Master Trained Technicians in the industry, which are all highly skilled in servicing all makes and models. Whether your GMC Sierra needs a tune-up or new tires or it is time for an oil change on your Buick, bring it into the Service Center at Mandal Buick GMC.